﻿In case you missed the memo, veganism is big right now. So big we’re constantly being warned about avocado shortages. And, so big that it got its own week dedicated to it on The Great British Bake Off. 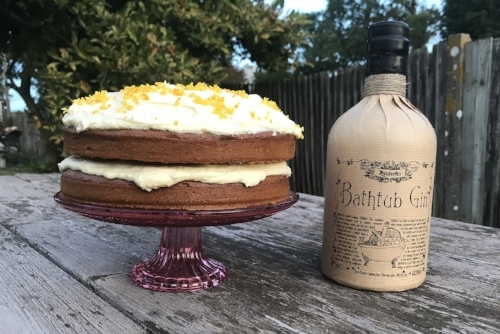 This week, the bakers will be trying their hands at creating egg and dairy free treats in the hopes of winning the coveted Star Baker title, so we thought we’d also have a go at baking a vegan cake - starring Bathtub Gin, of course. Not only is this cake vegan and gin-infused, it’s also got orange in the buttercream to really bring out the flavours of the gin botanicals. And, it’s surprisingly easy to make and tasty to boot. Preheat the oven to 180°c/ gas mark 4/ fan 160°c. Grease two 9 inch loose bottomed tins and set aside. Sift the flour, bicarbonate of soda and sugar into a mixing bowl, and mix together. In a separate bowl, whisk together the sunflower oil, milk substitute, vanilla, treacle, agave nectar and gin. Once mixed, add to the dry ingredients, then whisk together until thick and creamy. Spoon the mix into the cake tins, and put in the oven for 25-35 minutes, until firm to touch. Remove from the oven and leave to cool on a wire rack. While the cakes are cooling, make the buttercream. First, zest and juice an orange and a lemon. Next, beat together the spread, icing sugar, vanilla, lemon juice, orange juice, gin and a pinch of the zest, then leave to firm in the fridge. Once the sponge has cooled and the buttercream has hardened slightly, spread the buttercream evenly over one half of the cake and place the other sponge on top. Then, cover the top of the cake with more buttercream and sprinkle over the remaining zest to decorate.